US Bank makes Real-Time Mobile Rewards awesome. Are you listening Chase? Amex? Citi? UPDATE: Please also see: US Bank Real-Time Mobile Rewards. What works where? Wow. I didn’t see this coming. US Bank has just become relevant again in the travel rewards space. Via a feature called “Real-Time Mobile Rewards,” the US Bank Altitude Reserve and the US Bank FlexPerks cards now allow you to redeem points for travel at 1.5 cents per point without requiring you to book through US Bank’s travel portal. I never thought I’d say this about a US Bank product, but… this is a feature that I really wish Chase, Amex, and Citi would mimic. This enhancement came to my attention yesterday when I received mailers like the one shown above for my Altitude Reserve card and my FlexPerks card. The mailers indicate that you can now redeem points for travel, at 1.5 cents per point value, regardless of how you bought that travel. That’s huge. Due to an issue I’m having with not being able to log into my US Bank account (the darn issue is going to take a week to solve! ), I asked a friend to test this out for me. He followed the directions in the mailer to activate Real Time Mobile Rewards and selected all available categories. Then he booked just under $500 in airfare through Expedia and paid with his Altitude Reserve card. Instantly he received a text asking if he’d like to redeem about 33,000 points the purchase. All he had to do was text back “REDEEM” and he was done. Quite a few travel rewards cards offer more than 1 cent per point value when redeeming points for travel. Popular cards that do this include Chase Sapphire Reserve (1.5 cents per point), Sapphire Preferred and Ink Business Preferred (1.25 cents per point), Citi Premier (1.25 cents per point), and US Bank’s Altitude Reserve and FlexPerks cards (1.5 cents per point). With the new exception of US Bank, though, in all of these cases you must book travel through the bank’s travel portal in order to get that enhanced value. Bank travel portals sometimes have worse prices than can be found elsewhere. You can now shop around and buy from wherever you want! Often it is impossible to find the flights, hotels, etc. that you really want through a bank’s portal. There is no effort required to use your rewards. Simply use your card to pay for travel and then decide whether to offset those charges with points! By paying with your credit card and then offsetting the charge with points, you should earn credit card rewards for those travel purchases. Note that cards like the Capital One Venture Rewards card and Barclaycard Arrival Plus already work the same way: you do not need to book travel through a special portal in order to get full value rewards. The difference is that the Capital One and Barclaycard cards offer just 1 cent per point value whereas US Bank offers 1.5 cents per point value (granted, though, each of these cards earn 2 points per dollar for all spend). Check the boxes to select your desired rewards categories (or select all). Now when you use your US Bank card to make purchases within your selected categories you should be texted the option to redeem points for those charges. For travel purchases only, the number of points required should make the points worth 1.5 cents each. For all other purchases, you’ll get only 1 cent per point value. Note that this feature is available to FlexPerks Visa, FlexPerks Business, and the Altitude Reserve, but not to the Amex FlexPerks card. See Also: US Bank Altitude Reserve Complete Guide. Greg, is there an option to redeem the points towards travel purchases other than by text? If I’m traveling internationally I don’t want to pay excessive text messaging costs. I think that text is the only option unfortunately. It looks like it is only available for Visa flexperks cards. Thank you. That’s good to know. This is also great news as now can redeem for Southwest flights without having to call their 800 number and waste tons of time. and hotel stays can be booked direct; earning hotel points and getting elite benefits. Does this make holding onto the Altitude card in Year 2 worth it? Mobile wallet is pretty much everywhere with samsung pay right? This card sounds very appealing now :O 4.5% on everything is really good. I’m planning to keep after this change. I’m earning 4.5% everywhere with Samsung Pay. This is better than anything else for in-person and in-app transactions. Does booking this way still allow for the $25 incidentals credit per ticket? Great question. I don’t know, but since it was a manual process anyway, I think you’d have a good shot at it. But how would they know how many tickets are on the itinerary? Did we ever get a data point on this? Definitely want to try it out, but, don’t want to lose out on the $25 incidental credits. In the comments of another post a reader said that it didn’t work. Well, I can confirm that US Bank does NOT consider ‘real time rewards’ a ‘travel reward’ redemption, thus, you are NOT eligible for the $25 statement credit per ticket. After much discussion with the rep her supervisor, I pointed out that even the denial letter for the statement credit makes no mention that you have to book a ‘travel reward’ through their redemption center to be eligible for the credit. It only mentions that you have to pay for the ticket using FlexPoints — which I did. Long story short, they gave me 2,500 Flexpoints per ticket that I was claiming the incidental reimbursement on as a courtesy. They also indicated that I was not the only one who’s made this mistake and that at some point they’re going to be better clarifying this whole airline incidentals credit in regards to real time rewards. Whatever that really means. Hopefully it means at some point they’ll simply officially allow it on real time rewards. Thanks for the additional data point. Greg, did the friend in your example confirm they got the “double-dip” rewards for the travel purchase? That would be pretty amazing if you get to redeem for points and gain points on the same purchase! This was confirmed in another blog from a user with first hand experience. 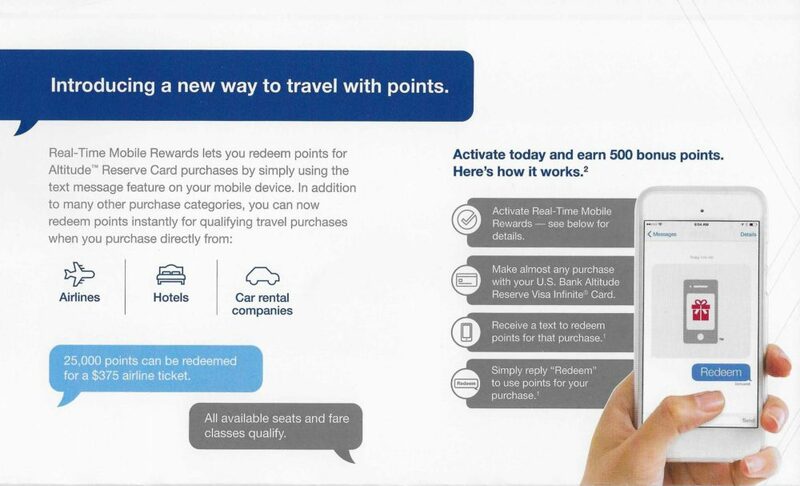 Under the “1” it says points can only be redeemed it purchased directly with airlines, hotels, car rentals, etc. so then how did your friend get credited for an Expedia purchase? it’s also says that it applies only to US merchants. I don’t see anything that says it applies only to US merchants. Where did you see that? I always prefer to book hotels direct for the loyalty perks. But does this mean I have to book prepay non-refundable rates in order to redeem Altitude Reserve points at 1.5x? What if I didn’t have enough points to cover the entire purchase? Can we do points + cash (credit)? I think it requires that you have enough points, but I’ll check into that. This leads to believe that points + cash is possible. Also, I was able to just select Airline category and lower the minimum purchase amount to just $10 – another sign you wouldn’t need to cover the entire purchase with points. Again, this is just the set up I was able to do on their website, haven’t actually tested it. Or are they saying if you use the credit card to only partially pay for the purchase you will not get a msg? I just had a situation that I don’t see spelled out in terms. Love to know others’ take on it (did I just miss it?). While the RTR will redeem at 1.5 on travel, you have to have enough points AVAILABLE to cover at 1:1. So when I had 57k points available that would cover an $850 hotel stay, it didn’t trigger RTR because I’d need to have 85k points available. Not cool. Others’ read/experinences? I checked today, it does not applies to partial pay, you have to have enough points to cover the entire purchase.I only had enough points to cover $105 in travel purchase @ 1.5c per point. I paid $130 from my visa signature flexperks card on southwest.com and did not received any text for redeeming my points for the purchase. Just FYI, my real time rewards settings is set to trigger it for purchases over $10. I later did another purchase for $90 at southwest.com and immediately received the message to redeem 6,000 points towards my purchase, which I accepted :). Hope this helps. This is good if you want to book premium economy or flights outside the USA since neither of those can be booked online. Saves a phone call and price mismatch issues. The wording makes it sound to me that the presets for lodging and car rental can not be lowered, but I could easily be wrong, since it doesn’t seem that I can actually see what my min purchase amounts are after setting them. “Minimum purchase amount for Lodging is pre-set at $500.00. Minimum purchase amount for Car Rental is pre-set at $250.00. All other participating categories will follow the minimum purchase amount selected below. I see that and hope it’s not really the case. If so I don’t get why they even show lodging as a choice under the selected minimum to check off or not. I’ll give it a try on a stay Monday and know by mid-week. You can check you setting after activation. Any conclusion to this Carl? The jury is still out. When I look at the USB site the charge shows as completed, but it has not increased the current balance yet. I’ll see if I get a text when the current balance reflects the charge and let you know. It’s now reflected in balance, but no text. Lodgings set at $25. Looks they have the $500 minimum in place like they said. I’ll let you know if any change. Thanks. Seems pretty certain now that the $500 minimum is unchangeable. Boo. @Greg – this is very cool! I have other fam members that have Flexperks to burn and this is just great as we usually book airlines directly. Just to confirm, this works with the FlexPerks Edge business card which I have. I know that sometimes the features aren’t compatible – for example, the BE card doesn’t offer the 12 Gogo passes, but I was happy to see this feature worked. I cannot activate the offer. When I click “activate” it takes me again to the login page. Hopeoks later or tomorrow. Greg, you finally going to break down and buy a Samsung phone? LOL, it’s certainly more tempting now! Watch Out, US Bank will steal your points and close your cards accusing you of buying gift cards even when no gift cards were bought. They will also close the rest of your cards at the bank and steal those points too. I bought a few gift cards when I was doing my MSR, but I kept my purchases of GCs under $400, and my accounts were not closed. Did you ever end up receiving any compensation for the confiscated points? Why did they think you were buying gift cards? Hey Greg. The information below is pretty important regarding your post if true. I just called US Bank Flexperks customer service to inquire whether the $25 airline allowance applied to Real Time Rewards redemptions for an airline ticket which according to the supervisor I spoke with, it does not. More surprisingly though, the supervisor told me that the redemption value for Real Time Rewards in the travel category is the same 1 cent per point despite the postcard showing a sample redemption at 1.5 cents per point. I hope this is not accurate, but can you please double-check with your sources at US Bank? I just spent $158.60 on an airline ticket and got a notification to redeem 10,573 points, which I accepted. Now a RTR Credit of $158.60 is showing on that account. It’s possible that since this is a very recent change that only seems to be documented via postcard, workers may not have been informed. Previously, RTR was indeed 1¢ across the board (but excluded some categories like fuel and restaurants). Dang, wish I’d seen this last weekend (insert comment about the irony of being at FTU and getting behind on related blogs). I had a Fairmont stay (using a free night certificate from their long-gone CC) and put the food charges (beyond the $50 credit) on my Altitude Reserve. Alas, I hadn’t known to update Real-Time Mobile Rewards settings, so I didn’t get an alert for that purchase as the amount was < $100. Of course, I likely wouldn't have noticed that the number required for redemption was a better value than the usual 1¢ (that I would never use). I don't know why US Bank couldn't have sent this major update via email instead of (or in addition to) snail mail. But sure enough, I had two of these mailers awaiting me when I returned to town. Such a quirky company. I've long had difficulty doing redemptions via the terrible portal, as it's almost impossible to find fares that aren't Basic Economy. So, this is a major step forward and helps me see my four (!) USB travel cards in a new light. I immediately used Altitude to purchase a DL ticket (via Delta.com so I'd earn Starpoints), and I got the notification and redeemed about a minute later. Both the ticket purchase and travel credit show as pending on that card. Works for me! I can finally access my account now. I see (as others have pointed out) that the minimums for lodging ($500) and car rentals ($250) can’t be changed. I’ve added a section to this post about that. It’s interesting that they don’t have a mandatory minimum for airfare. would buy AA or southwest gift cards trigger this? Good question. I’d expect so, but I haven’t tested it. I just called FlexPerks and the rep had no idea what I was talking about. I haven’t received a text, and I set my charges for travel. Spent $120 on the card for a RyanAir flight. Which is it? Did you purchase the ticket directly from Ryan Air? If not, the charge may have come through as from the travel agency rather than from the airline. Or, it’s possible that RyanAir isn’t coded properly as an airline (but this seems less likely to me). Also, make sure that you’ve checked “Airline” as a type of purchase you would like to use Real Time Mobile Rewards with, and make sure to set the minimum low ($10 is the lowest you can go). Yep, bought direct. I’ll check everything I have in RTR to make sure I don’t miss anything. Does it make a difference that I have a FlexPerks Visa vs. Altitude Reserve? Just spoke with a FlexPerks rep because I haven’t been getting texts, and she didn’t know what I was talking about with the redeeming 1.5 cents via RTR. I told her to talk with the rest of the reps in the office and make sure the company was on the same page with what they were mailing out. Which is it? This post may need an update with data points. I am travelling in Canada and did not get the text for hotel purchase in excess of 500 USD and a rental car purchase in excess of 250 usd. I did get the text for my airline baggage charge before we left the US but did not send the “redeem” text until the next day and got the response that the time to redeem had elapsed. So RRR was a big fail for me. Do the rules say purchases need to be in the US or made in USD? I had been really excited, especially since I just got a samsung. Now I worry I will never be able to redeem because I rarely pay cash for US hotel stays. Has anybody tried this with Uber? Uber transactions do get reimbursed toward the $325 travel credit so I would imagine it would work but I want to confirm. Just signed up. From a marketing perspective this is actually very smart. They’re not spending any more on the rewards. But this does 1) encourage users to put more spend on the card in the hopes of being able to redeem points, even spend that doesn’t get the 3X bonus; and 2) greatly increase cardmember interaction, increasing “mindshare” and thus – US Bank hopes – wallet share. Very smart.